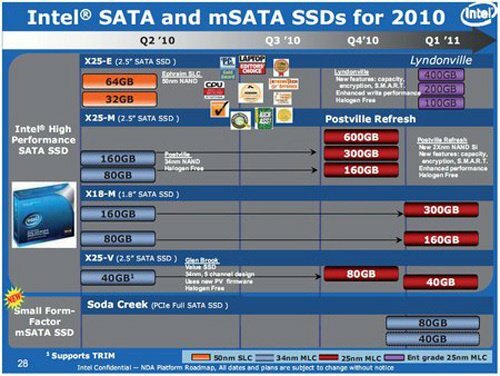 A leaked slide of Intel's nine-month solid state drive (SSD) roadmap shows a 400GB multi-level cell (MLC) enterprise solid state drive due in the first quarter of next year. A French Mac website posted the apparently real slide on Sunday and it shows a transition to 25nm MLC process technology but not single level cell (SLC) 25nm technology. We guess that will come later in 2011. The roadmap starts from four places, the current X18-M and X25-M and -V MLC and X25-E SLC products, and goes to five places. A new entry-level SSD code-named Soda Creek will arrive in the first quarter of 2011 (Q1 2011) and be a small form factor mini-SATA device using 34nm process technology with 40GB and 80GB capacities - Intel saying it is a PCIE full SATA SSD. The current entry-level 40GB X25-V (for value) 2.5-inch SATA SSD transitions from 34nm MLC to 25nm MLC with an 80GB unit in the last quarter of this year and a 40GB one in Q1 2011. The X18-M (mainstream) 1.8-inch SATA 80GB and 160GB products get replaced by 160GB and 300GB ones in Q1 2011; a busy quarter for Intel, using the 25nm MLC process. Moving up, the X25-M 2.5-inch 80GB and 160GB products have a Postville refresh in the fourth quarter with 160GB, 300GB and - wait for it - a 600GB version. These feature the SMART interface, encryption and enhanced performance. We have been waiting for an X25-E development as this is Intel's fastest flash, yet it uses an older 50nm SLC technology, and missed out on the transition to the 34nm process that benefited the other X18 and X15 products. It is moving to Lyndonville product in Q1 2011 using what Intel calls "enterprise-grade 25nm MLC" and featuring encryption, the SMART interface and enhanced write performance. The capacity points are 100GB, 200GB and 400GB - a sizeable jump from the current 32GB and 64GB. We guess that enterprise-grade MLC means its performance and endurance have been enhanced through clever controller technology and over-provisioning compared to ordinary MLC flash. The current X25-V and X5-M, and coming Lyndonville and Postville products, are all labeled halogen-free on the Intel slide. There is no information about whether 6Gbit/s SATA interfaces will be used in the forthcoming models. It would be surprising if it were not used though.